In our recent special issue, “The Gilded City,” we described New York as “a city of dazzling resurrection and official neglect…remarkable wealth and even more inequality.” As reported by the Fiscal Policy Institute, the top 1 percent of New York City’s wage earners took in nearly 39 percent of the wealth. Between 2000 and 2010, family income in New York City’s wealthiest neighborhoods increased by over 55 percent in spite of the recession, while family income in the city’s poorest neighborhoods actually decreased by 0.2 percent. As reported by the US Census Bureau and cited recently in The New Yorker, if the borough of Manhattan were a country, the income gap between the richest 20 percent and the poorest 20 percent would be equal to that in countries including Sierra Leone, Namibia and Lesotho. The human cost of this staggering inequality in America’s largest city cannot be understated: neighborhoods without daycare, grocery stores, quality schools or equal access to transit. Residents in one New York City housing complex, in the shadow of the wealthy DUMBO neighborhood, have to walk more than a mile to clean their clothes. The inspiring movement of low-wage workers to organize and fight for higher wages is promising, as is the city’s recent hard-won passage of paid sick days for most (but still not all) New Yorkers. But as The Nation has reported extensively over the last five years, income inequality remains a foundational issue that plagues New York, and many of America’s largest cities. DeBlasio proposed a wide range of solutions, from dramatically expanded job training and apprenticeship programs to more investments in career paths for indigenous New Yorkers—people who have grown up in many of the devastated neighborhoods described above. In his proposal, DeBlasio focuses extensively on revitalizing New York City’s university system, CUNY, as a pathway to better jobs for immigrant and low-income communities. And he proposes major reforms to the City’s economic development program, challenging the City to focus more intensely on economic development across all five boroughs. 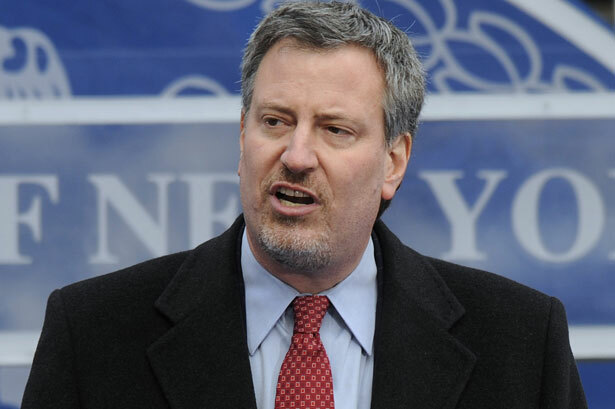 De Blasio’s plan mandates a living wage and a plan to provide healthcare for all workers in businesses receiving city economic development funding. And he pointedly proposes expanding paid sick days for the 300,000 people who were left out of the recent New York City paid sick days bill, which we also support as a critical next step for low wage workers. Most interesting about the plan though is, what Nation magazine contributor Jarret Murphy called “the Robin Hood aspects,” including a proposal to end corporate subsidies and direct that money to CUNY, and to a revolving loan fund for small businesses. This goes hand in hand with one of de Blasio’s other big ideas—an income tax surcharge on the wealthiest New Yorkers to pay for expanded early childhood education and true universal pre-k, which is given only to a fraction of the city’s 4-year-olds in a hope-for-the-best lottery system. Perhaps no other investment would do so much to help the next generation of New Yorkers. As we have argued in The Nation since the start of the “great recession” and well before, we can’t truly address income inequality without addressing taxes and corporate tax loopholes. While all the leading Democrats in the race decry inequality, de Blasio so far has the most substantive proposal to raise taxes on the wealthy back to the levels the city set after 9/11. This is a critical component of any serious plan to address inequality, and must be on the table. Inequality is, of course, a global challenge. The question, then, is how New York City—as America’s largest city and its most extreme example of inequality—can be a laboratory for solutions. What can a mayor actually do about urban inequality? Given the priorities of the last twelve years and a genuine moment for new leadership in New York, this is a once-in-a-generation opportunity to answer that question. Read The Nation’s special New York issue for more on Bloomberg’s legacy and the possibilities for a more progressive city.